Polish naturalist; born at Warsaw 1841; son of Isaac Kramsztyk; educated at the Warsaw gymnasium, and studied medicine in the Medico-Surgical Academy, and physics and mathematics in the University, whence he was graduated in 1866 as master of natural sciences. Unable, on account of his religion, to obtain an appointment as teacher in the gymnasium, Kramsztyk took a position in the Polish Bank at Warsaw, where he was employed until the closing of the same in 1886. Simultaneously he was a teacher in the Commercial College and in various private schools. 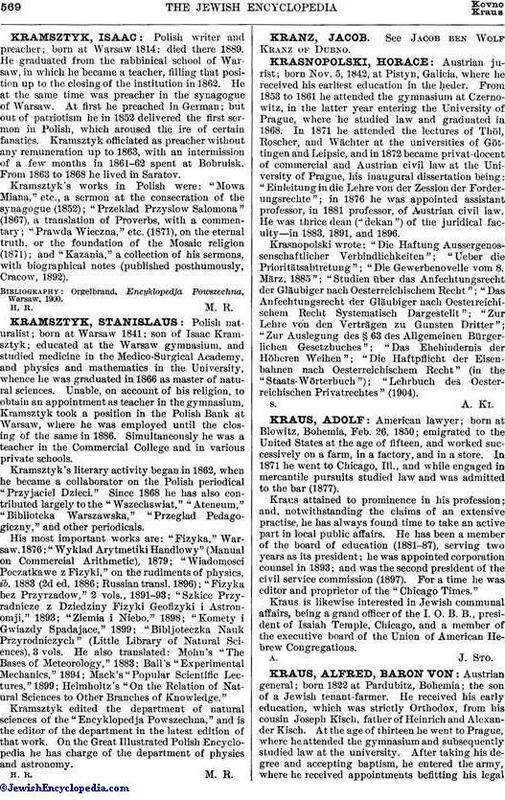 Kramsztyk's literary activity began in 1862, when he became a collaborator on the Polish periodical "Przyjaciel Dzieci." Since 1868 he has also contributed largely to the "Wszechswiat," "Ateneum," "Biblioteka Warszawska," "Przeglad Pedagogiczny," and other periodicals. His most important works are: "Fizyka," Warsaw, 1876; "Wyklad Arytmetiki Handlowy" (Manual on Commercial Arithmetic), 1879; "Wiadomosci Poczatkawe z Fizyki," on the rudiments of physics, ib. 1883 (2d ed. 1886; Russian transl. 1896); "Fizyka bez Przyrzadow," 2 vols., 1891-93; "Szkice Przyradnicze z Dziedziny Fizyki Geofizyki i Astronomji," 1893; "Ziemia i Niebo," 1898; "Komety i Gwiazdy Spadajace," 1899; "Bibljoteczka Nauk Przyrodniczych" (Little Library of Natural Sciences), 3 vols. He also translated: Mohn's "The Bases of Meteorology," 1883; Ball's "Experimental Mechanics," 1894; Mack's "Popular Scientific Lectures," 1899; Helmholtz's "On the Relation of Natural Sciences to Other Branches of Knowledge." Kramsztyk edited the department of natural sciences of the "Encyklopedja Powszechna," and is the editor of the department in the latest edition of that work. On the Great Illustrated Polish Encyclopedia he has charge of the department of physics and astronomy.